The update of either vCSA or PSC can be achieved through the VAMI interface which was introduced back in 6.0U1 or through the appliancesh command-line interface. This method requires internet access from your appliances. 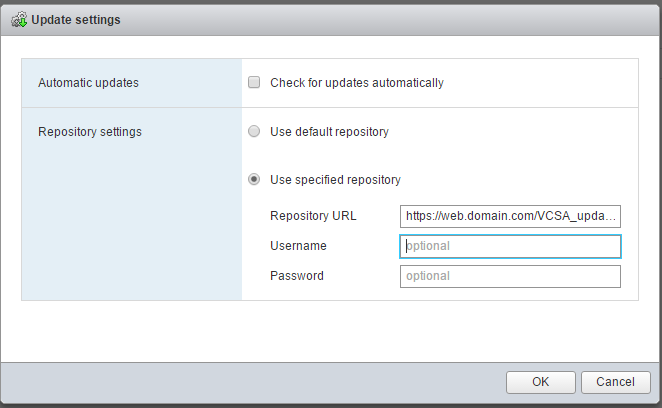 This method will go out to VMware’s repository https://vapp-updates.vmware.com/vai-catalog/valm/… and verify you are on latest. Wait for updates to complete. This method can be used if you do not have internet access from your appliances by setting up a local repository. Setup a webserver on your network (ISS or Apache) that will be accessible to the vCSA and PSC. Create a directory called PSC_updates or VCSA updates. Names can be changed. On VMware support site now download update but make sure to download the zip update bundle. Extract the zip update bundle to the folder you created earlier. This method is pretty straight forward. On VMware support site download the ISO for latest vCSA and/or PSC.